CYTO-STAT tetraCHROME CD45-FITC/CD4-RD1/ CD8-ECD/CD3-PC5 and CYTO-STAT tetraCHROME CD45-FITC/CD56-RD1/CD19-ECD/CD3-PC5 Monoclonal Antibody Reagents are for use on the Cytomics FC 500, Navios, and Navios EX Flow Cytometers. The reagents are also used with the tetraCXP System for FC 500 Flow Cytometry System, Navios tetra Software for the Navios System, and Navios EX tetra Software for the Navios EX System. Used alone or in combination with the automated systems, the reagents are intended "For In Vitro Diagnostic Use" and allow simultaneous identification and enumeration of total CD3+, total CD4+, total CD8+, dual CD3+CD4+, dual CD3+CD8+ and/or total CD3+, CD19+ and CD3-CD56+ lymphocyte percentages and absolute counts in whole blood by flow cytometry. 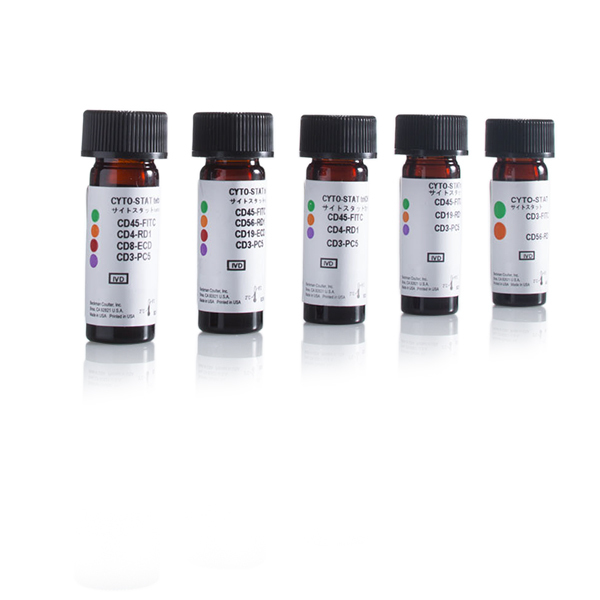 The systems also provide the CD4/CD8 ratio when using CD45-FITC/CD4-RD1/ CD8-ECD/CD3-PC5. These reagents are indicated for use in the immunologic assessment of patients having or suspected of having immune deficiency.